Another week is in the books for the Piers Park/Courageous Sail/Community Boating crew! As I alluded to in my last post, one of the only snafus of our program so far has been that our fishing results have been...less than ideal. While we’ve been catching a plethora of crabs and got to observe a lobster last week, our fish counts have been low. Low as in - zero fish. But while this may be discouraging to some, our kids have proven themselves to be well-suited to fishing culture. They’ve been patiently and positively waiting and this week it paid off! 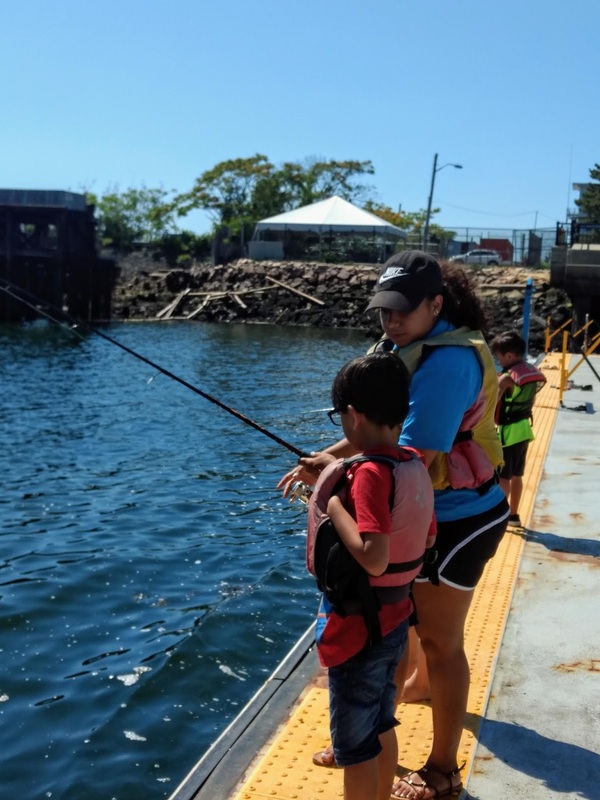 LHE Kharliyah shares her fishing expertise with a young Piers Park Harbor Explorer! 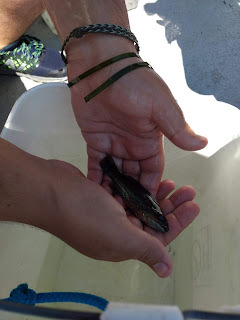 While these fish species are quite hearty, since we are working with pretty young kids they haven’t always learned the concept of soft hands yet. With lots of hands in the tank, our fish can get a little stressed. We have diverted this energy into a new task that I like to call habitat-building! We talk to the kids about the importance of shade and cover in the ecosystem, and challenge them to build a nice, homey touch tank for our creatures by collecting rocks and algae species. So far they have taken to this with enthusiasm, and this also gives us an opportunity to talk about some different ecological concepts! In addition to the fish we’ve caught, we have had some luck on the lines this week. At Piers Park, campers caught a giant spider crab and a lobster with their fishing poles! While crab-trapping is always great, nothing compares to the excitement on the kids’ faces when we pull something up on a line. Even though we haven’t pulled in a big fish yet, the spider crab and lobster were really unique and fun catches, and we had a great time talking about their biology and, of course, posing with them! We’ve also been having a great time at our other sites, catching tons of crab at Courageous and deploying our eel trap at CBI! I’m so excited to see what we can get in the eel trap, especially, since I’ve never caught one before! You’ll have to check back soon to see what we can catch out on the Charles River!